Recently retired Frankie Horne is one of the most famous & successful rugby sevens players in the history of the modern game. Representing South Africa since 2007, Frankie has managed an incredible (and record breaking) 68 consecutive tournament appearances. In that time, he managed to pick up the World Series title in 2008/9 & collected a Gold at the 2014 Commonwealth Games in Scotland. 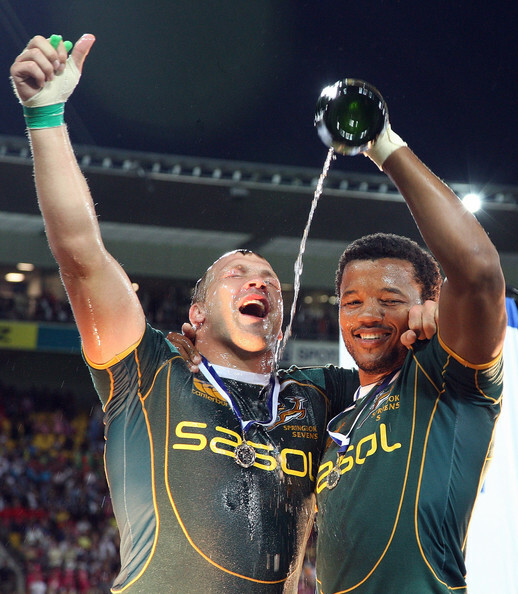 SA Rugby President Mark Alexander, upon hearing of Frankie's retirement last year remarked that, "He was one of those guys you could always count on, as the results have shown. Frankie consistently delivered stand-out performances for the team over many seasons and always gave his all. He will be remembered by many fans as one of the guys who embodied what the team was all about. He was skilful, but it was his refusal to take a step back that endeared him with rugby fans across the rugby world". Frankie, thank you for taking a few minutes to chat with me today; so, before you would head out onto the pitch, would you eat much, or would you prefer to play on an empty stomach? "Never could stomach anything much except muffins and stuff like that before I played or on game day for that matter. Would rather play on a empty stomach than eat anything that would sit in my throat". So did you eat as soon as you finished a game then? "On average, we roughly had a 90min gap between games. So had our protein shakes or recovery drinks after ice baths and then head up for coffee and a muffin or whatever is light. The management always had muffins, sweets and stuff like that available for us so that aided me a lot. So as soon as i could, i’d just eat something". Do/did you go for protein bars or energy shakes or similar? "I always had a tub of pure proteins with me on tour and for most training sessions. Used to mix it with energy drinks like Powerade/ Gatorade and the likes. Been using a protein called Peptopro and not only does it aid recovery but over a period of extended use, reduced soft tissue injuries". Did your diet change much between on & off season? Did it have to change much based on where you were competing or because you travelled so much (Tom Mitchell, GB & England captain told us, often getting the right food in a hotel in Vegas or Dubai is a struggle and you just have to eat whatever is available or in front of you)? "We experimented with diets when i started in 2006, most guys tend to eat fairly healthy in general but quite a lot ate fast food and the odd unhealthy meals here and there when they’re at home, but when in camp or on tour, they’d eat very healthy. The end result for it was that we had crash in performance on camps and tours as our systems weren’t used to the diets and often we’d shock the system. So we started to eat on tour as we eat at home but in moderation. So the odd fast food meal and the like didn’t hurt us that much on tour as our bodies were used to it as hotel food was rather dull and tasteless, as Tom mentioned as well, finding good food was hard so we kinda cheated the system. So in turn we try to keep it more or less the same in off season and in season, just cutting the sweet stuff a bit more and drinking habits". Just how much did you have to eat to fuel your training/maintain your weight? "My body is kinda weird in the sense of, i don’t have to eat much to gain weight and struggle to lose it. Where other guys have to eat more and rely on a fair bit of supplements to maintain their weight. I had to keep my intake the same even if training camps were hard, otherwise i’d struggle to lose it and get to fighting weight. On average had biggish breakfast consisting mostly of grains and cereals. Lunch was what they gave us in camp and on off days a sandwich or something light and dinner was normally a big meal early in the evening with mostly meats and vegetables and the odd cheat meal every now and then". What did your rugby-training sessions look like away from the pitch? "We did a lot of so called “off feet cardio”, meaning gym based cardio, cycling, rowing and treadmill sessions in controlled environments on short but high intensity intervals". How important is hydration when you play, & train? "Hydration is arguably one of the most important aspects of training, playing and recovery. As we all know the body consists mostly out of water so maintaining a healthy balance of fluid intake is very important. Training always has multiple short water breaks which is hugely important and being properly hydrated but not overly for matches is key". What is the most common meal in your household & why? "Being South African, BBQ and red meats or meaty foods in general is very common for us. With my wife being a former international athlete as well, vegetables are unfortunately on the menu every night as well haha. Meals are mostly balanced with a fair portion of both meat and veg. Where the why comes in, meat is available everywhere here and almost all traditional meals consists of it". Do you have a cheat meal or drink? And what food(s) do you avoid? "Yes, I have. Love a pizza covered in toppings and a few beers every now and then. Avoid? Meals with high carbs". Do you have a favourite place to train or compete? 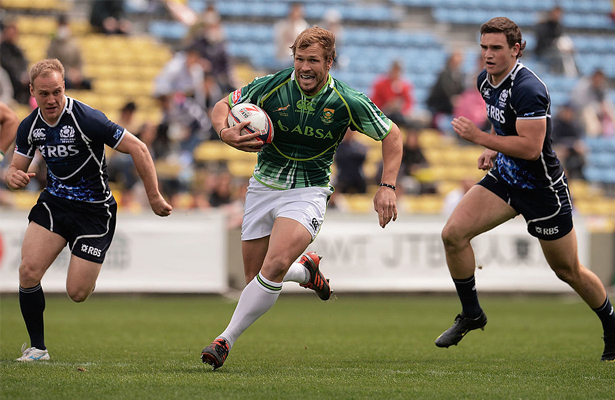 Where was the best location/atmosphere in Sevens to play? "Each venue has it’s allure, good and bad. I particularly loved Las Vegas. Venues with the best atmosphere, probably Dubai, Cape Town and Hong Kong". Do you have any 'game-day' rituals or superstitions? What do you do 5 minutes before you compete? "Regarding rituals, normally had the same sequence of things i did straight after warm up, and just as we jog on the field, i always took a knee and prayed for my safety and for that of my teammates and opponents. Superstitions, I never washed my boots or cleaned them, has always been bad luck for me regarding injuries and stuff". For a lot of athletes I've spoken to, the fame that comes with their success is sometimes unexpected, and often difficult to manage; how did you manage all the attention you received? "I just always tried to stay humble, as quickly as you receive it, it can be taken away from you at any minute. The end of your career is only a tackle away and when your time is done, another player will take your spot and number and be the next big thing".